This post is part 9 of 11 in a series on HubSpot’s Customer Code. Here’s a secret — I wanted to launch the first version of The Customer Code at INBOUND 2017. I was excited about the idea, and wanted to start talking about it. But our leadership team pushed back on me. They said there was no way we could ask other companies to step up and embrace their customer-first ideals when we still had so far to go ourselves. Of particular concern was the communication around our pricing and how customers got billed. We had to be the change. The way our pricing works varies quite a bit throughout our product lines, for customers at the Starter level, it tends to be extremely simple, but as our customers’ businesses gets more sophisticated, pricing tends to get more sophisticated as well. And feedback made it clear that, when it came to pricing, our most unhappy customer segment were customers at the Marketing Hub Professional and Enterprise levels — so that’s where we dug in. So year two renewal would roll around, and a lot can change in a year — a customer’s business may have grown, people forget about the details of a contract they signed 12 months ago, or perhaps the person who originally signed the contract is no longer with the company and a new person is now managing the account — and suddenly customers were getting a bill that was noticeably higher than the prior billing period with little context on why. Yes, many were very (and rightfully!) unhappy about this. The change needed on our end was actually quite simple–we simply changed the communication approach in our renewal process. First, we adjusted the timing of our communication about the new bill and made a change to our Terms of Service which reduced the number of days notice we needed to honor a non-renewal request – dropping it from 45 days to 10 days. Second, we now go out of our way to inform customers about growth in their contact database before the notice of non-renewal window closes. These changes give our customers far more time to evaluate the product, the value delivered over the past year, and decide if HubSpot still made sense for them. But most importantly, we can feel confident that we’re not surprising customers with an unexpectedly large bill. And with those simple changes in place…no more upset customers. Because our customers don’t mind paying, but they do mind feeling played. The same is true for your customers. No one should be surprised by an unexpected bill. No one should need a math degree to figure out what they’ll pay you. No one should need to jump through hoops to figure out what it might cost to do business with you. If we had gone live with The Customer Code in 2017, I would have given HubSpot a 5 on Tenet #8: I don’t mind paying, but I do mind being played. Today, I give us a 6. We’ve been doing some things right for awhile – our pricing is transparent and available on our website – and we’ve made substantial improvements on improving communication around renewals, but we’re not done yet. We recently asked our customer-facing teams how we’re doing when it comes to pricing transparency. Our support and success teams care deeply about the customer, but also understand the needs of the business, and we wanted to know how they think we’re doing when it comes to pricing. The vast majority of our customer-facing team members feel that our pricing, discounting, and cancellation process are all fair. But when we asked them what one thing they would change for our customers today if they had a magic wand the #1 request was simplifying pricing, packaging, and renewals. Fair isn’t enough to create a great customer experience. Transparent doesn’t always equate to simple. We’re being honest, transparent, and fair; but our customers don’t always feel that way. We can do better, and we’re going to. We have two plays kicking off that pair VP-level executives with our Voice of the Customer team to improve the billing and contract experience. Confusing pricing is a negative force on the flywheel of every business. Sixty-nine percent of people said that confusing pricing keeps them from making a purchase. After seeing this data at INBOUND one HubSpot customers, WashCard, went back to work and decided it was time to give transparent pricing a try. While the industry standard is to require a conversation with a salesperson before giving pricing, WashCard saw this as creating friction in their flywheel so they pulled back the curtain–boldly displaying pricing on their website for all to see. Customers don’t mind paying, but they do mind being played, they mind unexpectedly big bills, and they mind jumping through hoops to figure out how to budget for your product or services. If you want to grow, you have to charge for your services. But companies that are open and honest about their pricing, while making it simple to understand – grow better. Companies that use data effectively have made my life so much easier. I used to call a cab and explain my location, now Lyft just detects where I am and lets my driver know. I used to manually program my phone so it could tell me who was calling, now my phone looks at my email contacts and just tells me (or makes a pretty good guess). I can’t imagine running my business without data, and today I take an abundance of dashboards and charts for granted. I want companies to use my data, when they do the end result is that my life becomes a little easier, a little more convenient, I’m able to get more done in a day. But I don’t want companies to abuse my data. Spammy emails. Sloppy data storage. Eerily targeted ads. Data that is collected without my permission. That’s data abuse. 1) We are sticklers about doing the right thing when it comes to protecting our customers’ data. To some extent data protection can be solved with money and time, which we have done, investing money and human hours in data infrastructure and security. We’re thoughtful in how we build the architecture of our software–from the way our Sales Hub products connect to customers’ email accounts, to the SSO implementation that allows seamless (and safe) transition across portals. We made the decision to apply GDPR principles globally, meaning that regardless of a customer’s location, we will apply the principles around fairness, transparency, and data portability. But where I see our team really standing out is that we have optimized for fast resolution of vulnerabilities. There is no vulnerability-free software, and attempting to achieve that often slows the pace of innovation. Instead, we’ve invested in testing: in-house testing, four annual penetration tests, continuous vulnerability scanning, and a bug bounty platform. Our team is able to identify, prioritize, and resolve bugs quickly and efficiently. 2) We are sticklers about helping our customers do the right thing when it comes to protecting their customers’ data. We’re big fans of GDPR, which aligns very nicely with the philosophy of inbound. Earlier this year, we released a set of features that make it easy for our customers and their teams to comply with GDPR and other data privacy regulations. These features are made available to all HubSpot customers. 3) We want to make our customers’ lives easier by helping them use data to make their customers’ lives easier. HubSpot customers are growing businesses, many of whom have more impactful things to do than figure out a full AI integration. Our content strategy tool in Marketing Hub uses machine learning to understand the themes that search engines associate with your content. In the Sales Hub, we launched a send time optimization tool that gets your emails to the right person at the right time. Our machine learning team is currently building automated A/B testing that will run in the background, quietly optimizing campaign performance. HubSpot stores an enormous amount of data for our customers. We want to protect that data, help our customers derive value from it, and put a stop to all forms of data abuse. Data is a powerful tool that can be used for good, evil, or just general annoyance. Companies that choose to abuse customer data can certainly grow. But companies that protect data and use it thoughtfully to make customers’ lives just a little bit easier, grow better. Over the summer, Instagram and its parent company Facebook both announced they would integrate new tools to show users how much time they spent on each app. 4. How Do People Really Feel About Amazon’s Big Announcement? Here’s What We Found Out. 8. Self-Driving Cars Will Hit the Road in a Few Weeks. Are We Ready? Editor’s note: This is the third post in an 11-part series on the HubSpot Customer Code. You can subscribe to the full series here. Personas are a powerful tool to help align vectors. When everyone understands who your customer is, what their problems are, and how your business can help them you find that making decisions about hiring, budgeting, and even specific tactics becomes much easier. We’re big fans of personas at HubSpot, and even built a tool to help people make personas. But while a business sells to a persona, people sell to other people. A person has fears, hopes, and dreams. Segmenting by the topic of the first offer downloaded (i.e., social media, email marketing) — showed some positive results. Segmenting by business goals of the first offer downloaded (i.e., generating leads, improving sales pipeline) — showed even better results. Then they thought of something so simple, it was truly revolutionary. What if, instead of guessing what someone cares about based on the content they downloaded, we just asked them? The result was a 1000% (yes, that’s the right number of zeroes) improvement in our clickthrough rate. Our email team calls this approach the “pick-your-own-adventure” strategy. I like that. Turns out, it works for sales teams too. A few years ago, we switched from the classic BANT (Budget, Authority, Needs, Timeline) approach to sales to our own qualification matrix: GPCT (Goals, Plans, Challenges, Timeline). Once again, we’re starting with the goals of a unique individual. Like our email marketing team, the sales team also starts by asking: What are you trying accomplish? What does success look like for you. They’re selling to people, not personas. The second tenet of The Customer Code is: Treat me like a person, not a persona. We gave ourselves an 8 out of 10 here. We’re making it easier for prospects/customers to contact us how they want to contact us: Phone, email, chat, or a knowledge base that allows them to help themselves. We’re making it easier for prospects/customers to contact us when they want to contact us by offering 24-hour support. But we’re not where I want us to be yet. One area we’re focusing on that will help us get closer to a 10 is what we call the Nth user experience. When we onboard the first user of HubSpot, we once again use the GPCT method to understand that person’s priorities. We go deep with them to understand who they are and how we can help them get the most possible value out of the product. As a result, NPS for our first users is very high. But as additional users are added–Nth users–we see their NPS begin to slip. We’re not doing that deep “get to know me as a unique person” work. In many ways, that first user becomes the “persona” that we expect all users from that company to adhere too. But people are unique, even people who work for the same company. They might even be solving the same problem (increase revenue), but be focused on unique angles of that problem (increase brand awareness vs. increase MQL to SQL conversion rate). Nth users represent tens of thousands of people. There is no way we can give them the high-touch, human-led onboarding that happens for our first user in the first 90 days. So our product team is experimenting with more automated onboarding flows that orients additional users to a busy portal while also putting their unique goals front and center. Today, we onboard accounts. In the near future, we want to onboard individual people. Businesses should always look for patterns: Finding patterns is how we grow. And personas are powerful patterns to find broad similarities and direct our efforts. But we need to remember when we send an email, pick up the phone, or respond to a chat message that we are never communicating with a persona. We are communicating with a person. Respecting that individuality and uniqueness is how companies grow better. Ah, the holidays. It’s a holly, jolly time of year that’s full of egg nog, seasonal foods, and — in a word — chaos. Here in the U.S., the November holiday of Thanksgiving marks the start of the holiday season, with millions of people hitting the road and airports to visit relatives and partake in turkey feasts, parades, Black Friday shopping deals, and similar merriment. To help us navigate it all, Google has released a study using (none other than) its very own search data. 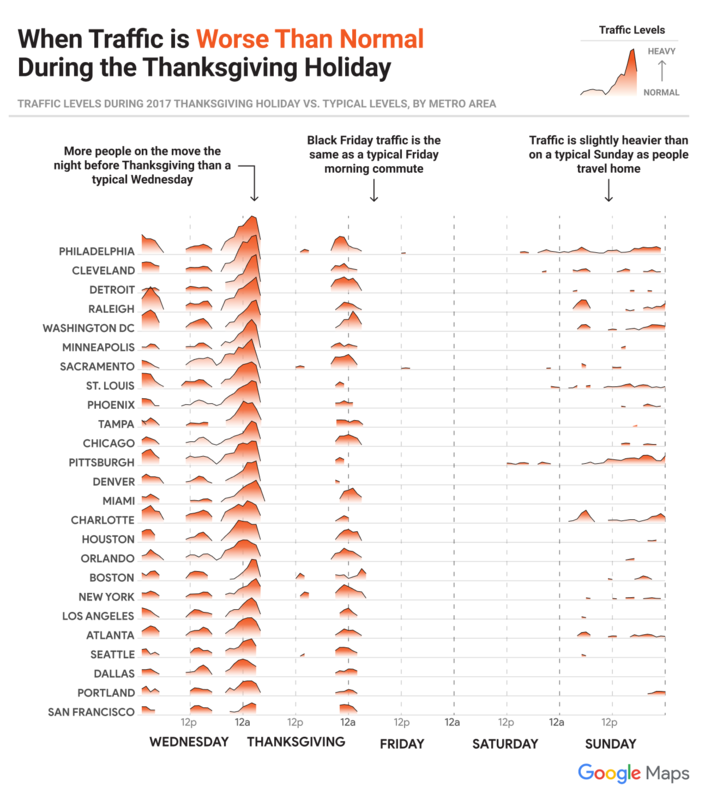 Leveraging Google Maps data from the time surrounding last year’s Thanksgiving holiday, Google compiled a report designed to help guide users on holiday-specific ins and outs — the most popular travel destinations, the best times to visit them, and the most optimal (or sub-optimal) times to be on the road this year. Below you’ll find our favorite tidbits from the seasonal study. First, let’s have a look at the U.S. national search trends in the days leading up to and following Thanksgiving. The data shows a pattern of shopping for video games during this time period, suggesting many people take advantage of seasonal sales leading up to December holidays — with particular enthusiasm for gaming. What specific category of video games people might be shopping for is another story. However, it’s worth noting that virtual reality (VR) headset manufacturer Oculus is launching a major, star-studded ad campaign in the days leading up to Thanksgiving. Perhaps the trend toward video game shopping signals a major step in the direction of the company’s lofty goals to make VR a mainstream technology. It wouldn’t really be a true-blue Google study if it didn’t drill down into micro search trends, too. That’s why the report also features an interactive tool that allows viewers to see searches by state. Solving for the user first, if you’re Google, also means letting users know how to avoid crowds and traffic. To address that first item, Google looked at Maps search data to determine the most popular business categories during the Thanksgiving holiday season, and when those establishments are the busiest. Food and drink reign supreme here, with bakeries and grocery stores topping the charts on the afternoon and evening before Thanksgiving. Then, there’s road traffic, where Google again provides a general chart breaking down when traffic congestion peaks during the Thanksgiving holiday in select metropolitan areas. The company’s findings also incorporate a localized, drop-down menu to help users determine the best times to hit the road. So, why do these search trends matter to the rest of us — like marketers or small-to-midsize businesses? Well, as is the golden rule with creating quality work, having this information can help marketers plan and develop content that pertains to these seasonal trends, and adapting them in a way that makes them relevant to your key audiences. Go forth and get festive with your strategy. And from our little, data-nerd family to yours, we hope all those celebrating Thanksgiving have a wonderful holiday. A recent Bloomberg report says that self-driving car maker Waymo is planning to launch a driverless car-hailing service imminently. In as little as a few weeks, the story says, Waymo — which is owned by Google parent company Alphabet Inc. — will debut a commercial, self-driving car service that some have likened to ride-hailing companies Uber and Lyft. The launch, if the rumors prove to be true, is said to be small, consisting of anywhere between “dozens or hundreds of authorized riders in the suburbs around Phoenix, covering about 100 square miles,” according to the Bloomberg story. But it raises a question. Are we ready for self-driving cars to hit the road? To find out, we asked 3,325 people across the U.S., UK, and Canada about their experiences with and expectations of autonomous vehicles. Here’s what they had to say. Despite much of the excitement around them, autonomous vehicles remain a highly emerging technology. Within our survey, over 88% of respondents indicated that they had not yet experienced riding in a self-driving car. However, despite most people not having ever ridden in a driverless car, many of them are curious to try. Nearly half of our respondents indicated that while they haven’t ever been in an autonomous vehicle, they’d like to try riding in one — suggesting that, once these cars do hit the road, the interest in experiencing them could help them go mainstream. We found that over three-quarters of respondents indicated that they believe autonomous vehicles will make up the majority of cars on roads — some day. However, most believe that it might be a while before that happens, with the highest number of respondents saying that they believe it will be a decade or two until self-driving cars take over. At the same time, most people agree that while there are still some safety issues to be worked out with self-driving technology, these vehicles are generally safe enough to be on roads. Approaching with caution can delay launches and slow the process of such a new technology going mainstream. Waymo’s own CEO, for instance, has remarked himself that he believes it will be “decades” before self-driving cars comprise the majority of vehicles on the road. However, Waymo’s “safety-first” mindset gives the company what some believe a positive, competitive advantage — especially when compared to some other autonomous vehicle makers. But until this fleet of self-driving cars hits the road, and you’re curious to know what riding in one is like in the meantime — check out the story of our experience here. Confirming rumors that began swirling last week, Amazon officially announced yesterday that its second headquarters — better known as HQ2 — will be split between two locations: Crystal City, VA (considered by some to be a neighborhood of Washington, D.C.) and Long Island City in the Queens neighborhood of New York. The announcement comes as no surprise to those who were saying for months that Amazon was likely to select the Washington, D.C. area as an HQ2 location — such as NYU Stern professor Scott Galloway, who earlier this year pointed out the proximity of Crystal City to Amazon CEO Jeff Bezos’s home in the area, as well as his preexisting ownership of the Washington Post. U.S. Senator Mark Warner of Virginia also commented on the Crystal City selection. After alerting users that their follower counts might drop in July, Twitter has once again said that, thanks to a bug, these previously “locked” followers reappeared and have once again been removed. Earlier this week, it was announced that Google would open source its artificial intelligence that plays a vital role in distinguishing one human voice from another. Also in the world of Google AI, The New York Times is using the company’s technology to help make its archive of photos (which date back to the 1870s) “smarter” — that is, to help recognize and translate text that describe the photos. Think of it as a visual-content autofill. Google announced this week that its AI technology will also be applied to Android devices to suggest GIF images, emoji, and stickers that it believes fit into your conversation. Starting yesterday, Google said, phones using the Android operating system and the company’s Gboard will use machine learning to know which of these visuals that best fit the specific context of a conversation. Yes — there’s more Amazon news. Last week, it was revealed that Amazon reached an agreement with Apple to carry more of the latter’s products on its website, including the latest models of iPads, iPhones, and the Apple Watch. The product selection will not, however, include Apple’s HomePod smart speaker, perhaps due to its potential competition with Amazon’s own Echo smart speaker products.